A surfboard is used in the sport of surfing. A typical surfboard is about 18-24 inches (46-61 cm) wide, 72-120 inches (183-305 cm) long, and several inches thick. It has a lightweight, buoyant core covered with a hard shell. In use, the surfer lays face down on the surfboard and paddles out into the ocean to the point where waves are beginning to rise. The surfer turns the board towards shore, paddles rapidly to match the speed of an incoming wave, then quickly stands up and balances on the board as it is propelled by the face of the breaking wave. One variation of the surfboard is the sail-board, which includes a short mast and sail used for wind surfing. Another variation is the body board, which is shorter than a surf-board and is ridden in the prone position. The surfboard, and the sport of surfing, are believed to have originated in Polynesia as early as A.D. 400. The Polynesians brought the sport with them when they settled in Hawaii. Hawaiian surfboards were made of wood from various trees on the islands. They were carved and shaped by hand, then stained and finished using the natural juices and oils of plants. The largest boards, called 'olos, were 144-240 inches (3.6-6 m) long and weighed nearly 200 pounds (91 kg). Experimentation with wooden Hawaiian surfboards during the 1920s and 1930s resulted in hollow board designs and the use of redwood and balsa laminates to reduce the weight. The first fiberglass surfboard was built in 1946. It consisted of two hollow, molded halves with a redwood stiffener, or stringer, running down the center. In 1949, Bob Simmons built the first board with a buoyant, styrofoam core sandwiched between two thin, plywood veneers and sealed with resin. The birth of the modern surfboard came in 1958 when Hobie Alter started producing boards with polyurethane foam cores. Later, he went on to develop fiberglassing techniques using polyester resins to form the outer shell. Today, almost every surfboard uses this construction. The typical surfboard has a rigid polyurethane foam core with an outer shell of fiberglass cloth and polyester resins. If a stringer is used in the design, it is usually made of wood such as redwood, basswood, or spruce. Colored fiberglass stringers can also be used. The fin, or skeg, is made of wood or laminated layers of fiberglass and resin. The history of surfboard design has been one of constant experimentation. Except for a period in the 1960s when there was an effort to market standardized, mass-produced boards, most surfboards have been individually designed and hand crafted by talented surfboard builders. Over the last four decades, boards have gotten shorter, then longer, then shorter again. One fm was followed by two fins, then three fins, as builders tried different designs to improve the board's ability to perform maneuvers. Some board builders used channels cut lengthwise along the bottom to improve stability. for that "perfect board." Some serious surfers use as many as five or ten different boards depending on their style of surfing and the surf conditions expected at a particular beach. Most surfboards are built one at a time in small surfboard shops. 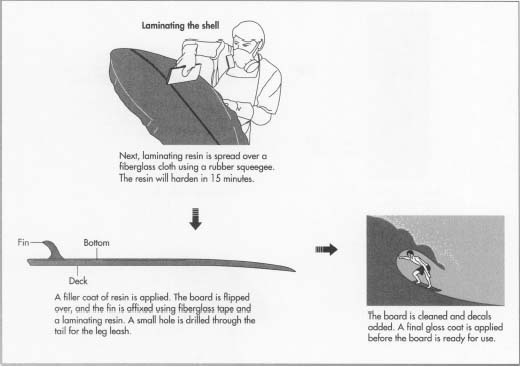 Although techniques and materials vary from one surfboard builder to another, the following is a typical process. core is taken out and allowed to finish hardening. 2 Once the core is hard, it is cut in half vertically from the nose to the tail. A thin stringer is glued between the two halves, and the core is then clamped back together to dry. Stringers provide stiffness and help keep the board from breaking in half. 3 The outline of the finished board is traced onto the rough core using a wooden template as a guide. The outline is then cut out with a saber saw. Starting with the bottom of the blank, the surface is smoothed and contoured to its final shape with a power planer. There are no templates or automatic machines to do this job, just the trained eye and experienced touch of the surfboard builder. When the bottom is finished, the board is flipped over and the top is shaped. A power sander removes any ridges left by the planer, and the stringer is contoured with a hand plane. Rough sandpaper is used to shape the sides, or rails. The blank is given a final sanding with fine paper, the position for the fin is marked, and the builder signs the blank with a special design or signature. 4 The shaped blank is now ready to be covered with fiberglass and resin to form the hard, outer shell of the surfboard. First, the blank is blown clean with compressed air. If the board is to be colored or have a design on it, acrylic paint is applied directly to the foam with a spray gun or air-brush. When the paint is dry, fiberglass cloth is laid over the surface of the blank and cut to fit. The top of the board, or deck, is laminated first. A polyester resin, known as a laminating resin, is mixed with a second chemical called a catalyst. This starts a chemical reaction which will cause the resin to harden in 15 minutes. The resin is poured over the fiberglass and spread evenly using a rubber squeegee. All of the fiberglass must be covered without leaving too much or too little resin in any spot. This process is known as glassing. When the deck is finished, the board is flipped over and the process repeated on the bottom. The board is then flipped once more, and the deck is given a second layer of fiberglass and resin for added strength and wear resistance. The laminating resin remains slightly tacky and rubbery when dry. 5 A second coat of resin, called the filler coat or sanding resin, is applied next. The filler coat fills any surface imperfections left in the laminating resin. Sometimes, this coat is called a hot coat resin and contains wax. In either case, this resin contains a slightly different mix of chemicals which cause it to harden completely. The deck is coated first and the board is flipped over. The fin is secured with fiberglass tape and a laminating resin. When the fin resin is dry, the bottom of the board and the fin are given a filler coat. When both sides are dry, a small hole is drilled through the tail to attach the leg leash. The leg leash is an elastic cord, sometimes made of surgical rubber tubing that the surfer attaches to one ankle. The leg leash keeps the board from floating away when the surfer falls, or "wipes out." 6 Any excess resin must be carefully sanded away. A power sander is used for the broad surfaces, but the rails and other sharply contoured surfaces are hand sanded to avoid gouging into the fiberglass layer. 7 The board is blown clean with compressed air to remove any residual sanding dust. On some boards, decals or color graphics are added at this point. A final coat of gloss resin is then brushed onto the board. Like the other two layers of resin, this final gloss coat is mixed with a catalyst and will harden within 15 minutes. The board is set aside for at least 12 hours to allow the gloss coat to completely harden. As a final step, the board may be wet sanded with very fine sandpaper, then rubbed, buffed, and polished. A surfboard is visually inspected several times during the manufacturing process. The blank is inspected for voids and other defects after it comes out of the mold. The shaping step, which is critical to the appearance and performance of the board, takes place in a well-illuminated area to allow the builder to spot any imperfections. The board is given a final inspection after the sanding and finishing steps to ensure it meets the craft standards of the builder. Some of the materials and processes used in building a surfboard are hazardous. Surf-board builders must use the proper safety equipment and have an understanding of the dangers involved. The polyurethane chemicals used to make the foam core are toxic and flammable. This process requires explosion-proof fume removal equipment and careful control of the room temperature and humidity. The shaping process produces fine foam dust which can be harmful if inhaled. A dust mask is required for the person performing this task. Finally, the laminating resin gives off poisonous fumes which require the use of an appropriate respirator for the person doing the glassing. Experimentation with surfboard design, materials, and construction techniques has produced some new approaches to surfboard manufacturing. As with anything new, there are advantages and disadvantages to each approach. In the area of surfboard design, the use of computers—especially those known as computer aided design, or CAD, systems—has simplified the design process. With CAD, the board builder can create a three-dimensional picture of a new board design, change dimensions and contours, then print out a finished drawing and contour templates. This saves considerable time over the traditional method of building and trying each new design, but many builders still rely on their eyes and hands to judge the look and feel of a new board. In the area of materials, some builders have tried boards built with a styrofoam core instead of polyurethane and an epoxy resin instead of polyester. The advantages of this combination are lighter weight, greater strength, and better impact resistance. The epoxy resin also produces less toxic fumes. The disadvantages include greater complexity to the resin preparation process, longer time to manufacture, and significantly greater cost. A variation of this approach uses graphite fiber cloth for reinforcement rather than glass fiber (fiberglass). This adds even more cost and produces boards in only one color—black. New approaches to surfboard construction include a computer-numerical-controlled (CNC) shaping machine that can shape and sand a blank in about 25 minutes instead of the several hours required for hand shaping. The disadvantage is that the machine is very expensive and must be reprogrammed every time a new design is required. 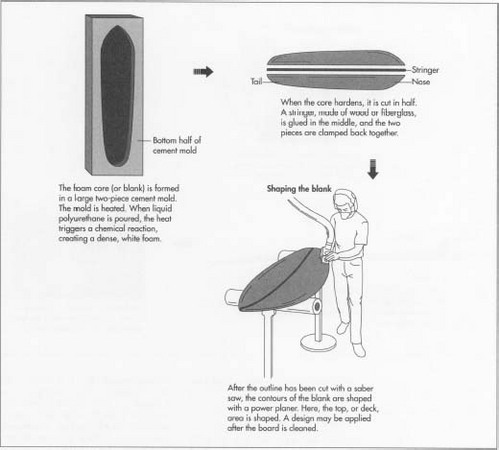 Another approach uses an existing surfboard as a mold pattern, then produces a duplicate shell which is filled with foam. Total time from start to finish is about 4.5 hours. Once again, however, the machine is very expensive and cannot produce new designs without an existing board to use as a pattern. For the foreseeable future, surfers are expected to continue to demand custombuilt boards at reasonable prices. The majority of this demand will be met by the hundreds of small surfboard crafters who build boards one at a time by hand. Kinstle, James. Surfboard Design and Construction. Natural High Express Publishing Company, 1975. Lueras, Leonard. Surfing: The Ultimate Pleasure. Workman Publishing, 1984. Shaw, Stephen M. Surfboard. Transmedia, 1983. Wardlaw, Lee. Cowabunga! : The Complete Book of Surfing. Avon Books, 1991. Young, Nat. The History of Surfing. Palm Beach Press, 1983. Krakauer, Jon. "Their Turf Is the Surf." Smithsonian Magazine, June 1989, pp. 106-19. The background section of the page says that "The first fiberglass surfboard was built in 1946." Can you tell me who made that board?